Another long lay-off for Leonard, another possible crisis of confidence – who knows. He released very quietly Various Positions in 1984. 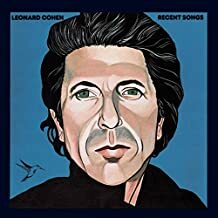 A terrible cover photo did not help sales; the boss of CBS records apparently said to him “Leonard, we know you are great – but are you any good?” The album sold poorly despite being sublime and containing what would grow to become his most famous song ‘Hallelujah’. In fact the whole album is quite religious. Best songs ‘Dance me to the end of love’, ‘The Captain’ and of course ‘Hallelujah’. But I really love the closer ‘If It Be Your Will’ – a beautiful resigning to God’s power, and even as a non-believer I can love this song. Best line ‘if it be you will, that I speak no more, and my voice be still, as it was before, I will speak no more, I will abide until, I am spoken for, if it be your will. Although the record sold very poorly at first, over time it has grown in popularity and Leonard was till singing two or three songs from it almost thirty years later. After the failure of Various Positions to re-establish Leonard, one of his female singers Jennifer Warnes (see W) decided to release an album of Leonard’s songs including two newer ones. Famous Blue Raincoat was a minor hit and helped to persuade Leonard not to give up. He started using synthesisers and drum machines to compose more upbeat songs and the resultant album four years later I’m Your Man was a triumphant success. I saw him on the live tour of this album and he was superb. The songs are all brilliant, although I have never really liked ‘Jazz Police’. The title song helped establish Leonard’s reputation as a ladies man, ‘Ain’t No Cure For Love’ is another winner. He put music to a poem by Lorca ‘Take This Waltz’ and it works superbly. But the album’s very best song is the closer ‘Tower of Song’ – a wonderfully simple melody and a great lyric – “I was born like this, I had no choice, I was born with the gift of a golden voice”. Simplicity itself, and like all great records it leaves you wanting more. Four years later and Leonard almost repeated the trick with The Future. Two brilliant, almost political (well, the closest Leonard would ever get to political) songs; the title track and ‘Democracy’, the rousing ‘Closing Time’, which many fans choose as their funeral song (I know, but you have to listen to the lyrics to understand why). The smooth ‘Light as the breeze’ and the best song in almost his whole repertoire ‘Anthem’ – “Ring the bells that still can ring, forget your perfect offering – there is a crack, a crack in everything – that’s how the light gets in” Two cover love songs, sung brilliantly I must admit – and an instrumental closer ‘Tacoma Trailer’. And what did laughing Len do next? Why, he simply vanished – for nine years. He had always been deeply religious; Jewish, but fascinated by Christianity (Joan of Arc and many other references), but in 1993 he decamped to a Zen Buddhist monastery on Mount Baldy near L A. He later claimed he wasn’t looking for spiritual enlightenment but simply he wanted to change his life. He became a servant and pupil of a Buddhist monk. In reality he did come down from the mountain a few times, but on the whole – this was a retreat. And as we heard nothing we may have assumed that was it. His record company released a live album with the uninspiring title Cohen Live featuring concerts from ’85 and ’93. It is okay but not very exciting. Better is a bootleg I have ‘Above The Soul’ of a whole ’93 concert. Same songs but much more atmosphere. Also a 1988 radio broadcast from Toronto Back in the Motherland which is quite good too. The thing about live albums, especially by Leonard is you aren’t really looking for anything different at all. It is just an excuse to drench yourself once more in his voice, his words, his world. I don’t play them that often – just running my fingers over the CD cases is sometimes enough.